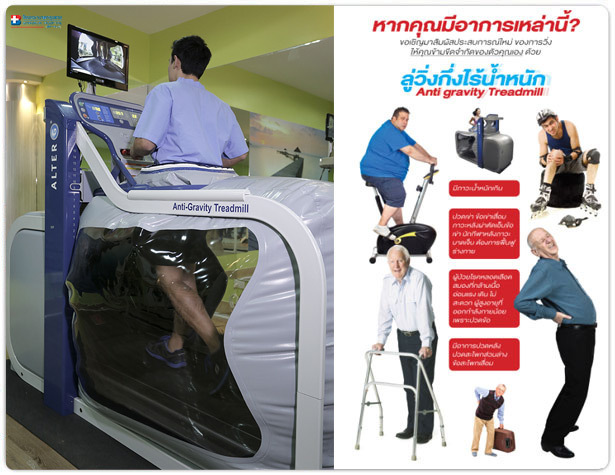 Anti Gravity Treadmill (Alter-G) at Bangkok Hospital Phuket is a brand new technology and the only one in Southern Thailand (2014). It could be identified as “Physical Therapy Exercise” providing the precise early partial weight-bearing following injury or surgery to restore natural gait and range of motion. The treadmill is developed from NASA Technology. Users feel like walk on the Moon and it is able to reduce the impact on the knee joint up to 80% which is unharmed for spine, hip joint, knee, and knee joint.